Drop in or phone one of display centres at Gladstone, Brisbane, Rockhampton or Forest Glen to discuss your needs. Whether it be a shed, garage, carport, farm shed or commercial project, no matter what you need, from the smallest to the largest shed, we’ve got the lot. Here at Australian Garages & Carports we pride ourselves on the design, strength, durability, versatility and range of our products. 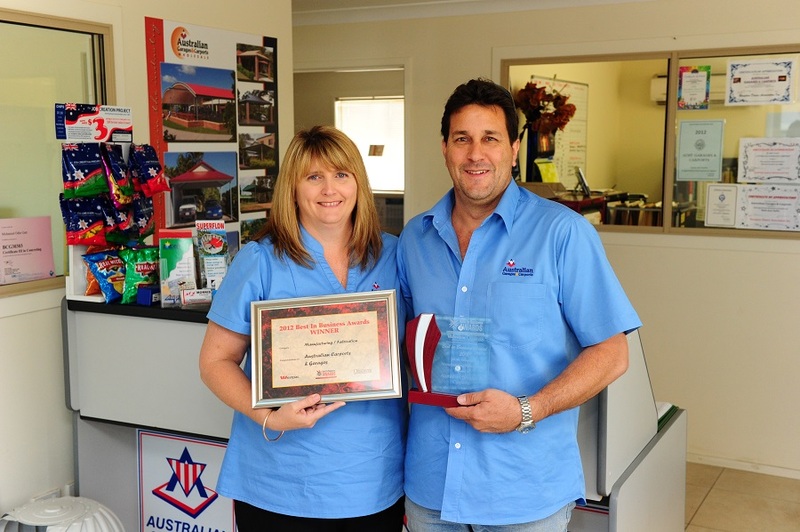 Australian Garages & Carports is owned and operated by Odin & Lyndel Gatt in Gladstone. They have been constructing and distributing the Australian Garages & Carports product for over 15 years. In 2012 they received the Best in Business Award for the Manufacturing/Fabrication category. In 1990, the original founder of Australian Garages & Carports, Dane Beerling, received an Australian Design Award in recognition of the outstanding quality and excellence of the innovative hip-roofed carport design. You can find this hip-roofed design, along with other unique roof styles at any of the Australian Garages & Carports display centres. At Australian Garges & Carports we can build exactly what you need, how you want it and importantly, we will do everything possible to have it done on time, every time. Our standards are the highest in the industry and every time we start a new project, we try to meet and exceed those standards. So give your closest shed distributor at one of the following locations: Gladstone, Forest Glen, and Brisbane and a call today.